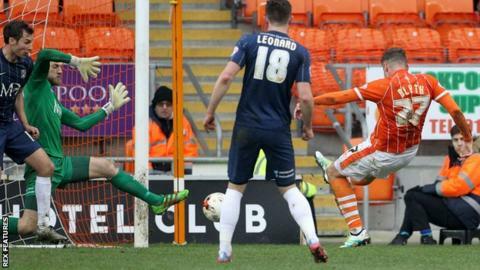 Blackpool made it four games unbeaten and took another step towards safety by beating play-off-chasing Southend. Jamar Loza missed a chance to put the Shrimpers ahead when he hit the post from two yards before visiting keeper Daniel Bentley denied Brad Potts. Blackpool went in front after the break when David Norris' shot fell to Mark Cullen and he headed in from six yards. The hosts sealed it when Cullen's cut-back was slotted in by Jacob Blyth, as he grabbed his first goal for the club. Match ends, Blackpool 2, Southend United 0. Second Half ends, Blackpool 2, Southend United 0. Attempt saved. Jack Payne (Southend United) right footed shot from outside the box is saved in the top left corner. Foul by David Norris (Blackpool). Will Atkinson (Southend United) wins a free kick in the attacking half. Tyrone Barnett (Southend United) is shown the yellow card for a bad foul. Danny Philliskirk (Blackpool) wins a free kick on the left wing. Foul by Tyrone Barnett (Southend United). Attempt missed. Sam McQueen (Southend United) header from the centre of the box is close, but misses to the left. Attempt saved. Adam Barrett (Southend United) with an attempt from the centre of the box is saved in the top centre of the goal. Substitution, Blackpool. Will Aimson replaces Mark Cullen. Corner, Southend United. Conceded by Tom Aldred. Goal! Blackpool 2, Southend United 0. Jacob Blyth (Blackpool) right footed shot from the centre of the box to the bottom left corner. Assisted by Mark Cullen with a cross. Attempt missed. David Worrall (Southend United) right footed shot from outside the box is close, but misses to the left. Corner, Southend United. Conceded by Jim McAlister. Attempt saved. Tyrone Barnett (Southend United) header from the centre of the box is saved in the centre of the goal. Attempt saved. Ryan Leonard (Southend United) header from the centre of the box is saved in the top centre of the goal. Attempt blocked. Jacob Blyth (Blackpool) right footed shot from outside the box is blocked. Clark Robertson (Blackpool) wins a free kick in the attacking half. Substitution, Blackpool. Liam Smith replaces Brad Potts. Attempt missed. Tyrone Barnett (Southend United) header from the right side of the six yard box is just a bit too high. Substitution, Southend United. Ryan Leonard replaces Gary Deegan. Foul by Jim McAlister (Blackpool). Adam Barrett (Southend United) wins a free kick in the attacking half. Substitution, Southend United. Sam McQueen replaces Stephen McLaughlin. Substitution, Southend United. Myles Weston replaces Jamar Loza. Corner, Blackpool. Conceded by Adam Thompson. Attempt blocked. Stephen McLaughlin (Southend United) right footed shot from the left side of the box is blocked. David Norris (Blackpool) wins a free kick in the attacking half. Foul by Gary Deegan (Southend United). Attempt missed. Mark Cullen (Blackpool) header from the centre of the box is high and wide to the right. Goal! Blackpool 1, Southend United 0. Mark Cullen (Blackpool) header from very close range to the bottom right corner. Assisted by David Norris. Attempt missed. Jack Payne (Southend United) left footed shot from the centre of the box misses to the right. Corner, Southend United. Conceded by Hayden White. Foul by Jacob Blyth (Blackpool). Stephen McLaughlin (Southend United) wins a free kick on the right wing. Second Half begins Blackpool 0, Southend United 0.